This paper presents simultaneous temperature measurements by three independent instruments during the WADIS-2 rocket campaign in northern Norway (69◦ N, 14◦ E) on 5 March 2015. Vertical profiles were measured in situ with the CONE instrument. Continuous mobile IAP Fe lidar (Fe lidar) measurements during a period of 24 h, as well as horizontally resolved temperature maps by the Utah State University (USU) Advanced Mesospheric Temperature Mapper (AMTM) in the mesopause region, are analysed. Vertical and horizontal temperature profiles by all three instruments are in good agreement. A harmonic analysis of the Fe lidar measurements shows the presence of waves with periods of 24, 12, 8, and 6 h. Strong waves with amplitudes of up to 10 K at 8 and 6 h are found. The 24 and 12 h components play only a minor role during these observations. In contrast only a few short periodic gravity waves are found. Horizontally resolved temperatures measured with the AMTM in the hydroxyl (OH) layer are used to connect the vertical temperature profiles. In the field of view of 200 km × 160 km only small deviations from the horizontal mean of the order of 5 K are found. Therefore only weak gravity wave signatures occurred. This suggests horizontal structures of more than 200 km. A comparison of Fe lidar, rocket-borne measurements, and AMTM temperatures indicates an OH centroid altitude of about 85 km. Wörl, R., Strelnikov, B., Viehl, T. P., Höffner, J., Pautet, P.-D., Taylor, M. J., Zhao, Y., and Lübken, F.-J. 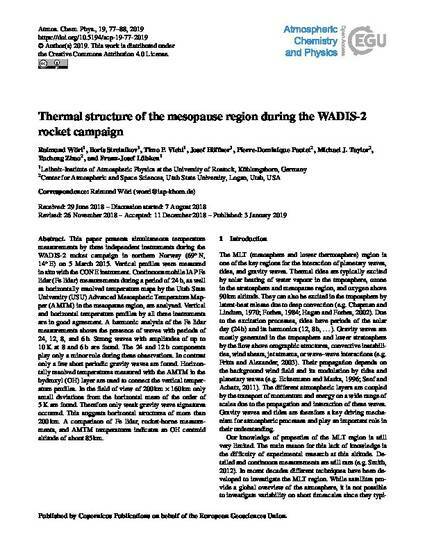 : Thermal structure of the mesopause region during the WADIS-2 rocket campaign, Atmos. Chem. Phys., 19, 77-88, https://doi.org/10.5194/acp-19-77-2019, 2019.